The techno gods are fickle: what they give with one hand, they take away with the other. Digital technologies are notoriously disruptive, leaving most forms of mass media in an ongoing state of flux. Photographers learned that lesson quickly when chemical processes developed over generations were banished by digital imaging in a few short years. Traditionalists mourned, but then the unexpected happened: archaic photo technology, like the cumbersome wet collodion process, became an art world niche in its own right. 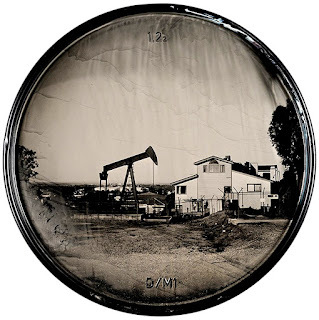 Matthew Brady used it during America's Civil War to almost single-handedly invent photojournalism with his dramatic battlefield photographs, and now David Emitt Adams uses it to create images directly on 55-gallon oil drum lids with his oversize hand-built camera and mobile darkroom. The result is this Power series at the Photo Alliance Gallery. In purely technical terms, works like his Sight Still Dim view of an offshore oil rig, top, reflect the physical and scientific demands of a camera a big as an oil drum lid, and an on-site process that requires the deftness of a ballet maneuver. Adams' arrival with his fantastical giant camera and gypsy-like mobile darkroom must have caused a stir as he created images like Exxon No. 2, Baytown Texas, a stark view of refinery and electrical towers arising from a sprawling industrial compound. The spidery steel spires of Arizona Public Service, Tempe, epitomize the the kind of otherworldly construction that caused 20th century power facilities to resemble retro-futurist scenes from vintage science fiction, even as views of old style oil rigs like Signal Hill No. 3 Los Angeles, above, remind us that oil extraction, like photography, was a 19th century innovation. The ghostly, archaic aura of these rounded, medallion-like images recall the memorial photographs found on European and ethnic American tombstones – a reminder that the oil industry is rapidly going the way of coal mining as workers are replaced by robots, and cleaner new technologies are gaining ground far faster than anyone ever dared to imagine. 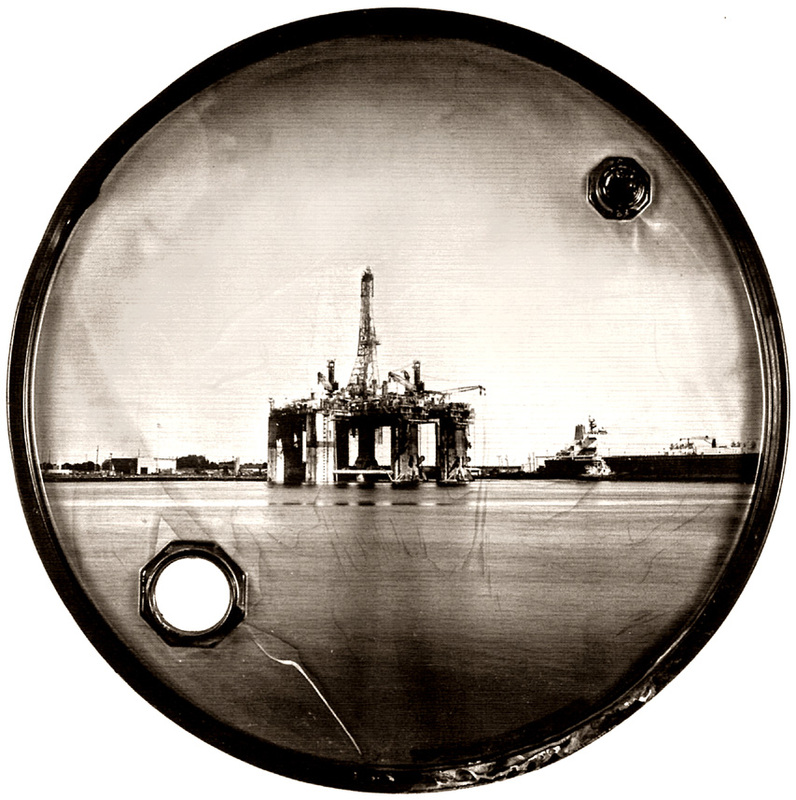 ~Bookhardt / Power: Photographs on Oil Drum Lids by David Emitt Adams, Through Sept. 2, New Orleans Photo Alliance, 1111 St. Mary Street, 513-8030.